His menu, which includes a carrot and coriander salad and chicken tagine, draws an unexpected savory parallel to the very foods I call ‘comfort food’, namely a carrot soup and roast chicken with assorted trimmings. The two sets of very similar ingredients produce two different flavor profiles, each conjuring up its own emotional response. I surmised, after reading this and conducting a little survey, that in fact all food is emotional, to a greater or lesser extent, eliciting comfort from one person but not necessarily from all. My quick, un-scientific survey, more along the lines of an email with one question to assorted friends; “If I say ‘comfort food’, I wrote, ‘what is the first thing that comes to mind?’, produced replies that I had anticipated with something starchy, rib-sticking or sweet: soups were high on the list from Matzoh ball to chowder, mashed potatoes appeared to be the firm favorite, and stews and roast chicken were mentioned by many, but so too were porridge, French fries, toast crusts, perfectly ripe peaches, a basket of figs, cake and a cup of tea. I decided to go for a walk to ponder this further. I often do this when I write, it helps me clarify my thoughts and pull the thread of my narrative together. It was a beautifully crisp, cool morning, one that necessitated a jacket (more on this in a moment) and light scarf. My dog jumped at the chance to romp around the bluffs as I meandered through the trees overlooking the ocean. Thin wisps of clouds drifted on the horizon, and a brave paddle boarder glided across the silken sea below us. I thought about comfort, the food related to it and what it meant to me. A series of images came to mind, all linked, oddly, to walks and the meals that followed. As a child, growing up in London, my family had a penchant for taking long walks across Hampstead Heath, often in bitter, damp weather. After an hour or two we would adjourn to Louis’ bakery where we’d slough off our steaming coats, rubbing our chapped hands together to get circulation going and order lashings of tea, cream filled meringues and cake. On other occasions we’d play, with two large teams of friends, an elaborate game of hide and seek in Highgate Cemetery between the Victorian monuments and the graves of Karl Marx and George Eliot in freezing fog. Afterwards we would pile in the cars, scurry home, pull off layer after layer of coats, sweaters, toe-off muddy boots and all sit down to a giant nosh-up of roast chicken, spuds and vegetables. My family in France was no different when it came to walks followed by food, in clement weather or foul. We hiked up mountains so that we could eat a picnic sitting on top with a baguette, fromage, jambon in hand; we’d tromp though the snow, freeze our toes only to rush back, thaw out and truly savor my grandmother’s hachis parmentier (French Shephard’s pie). We’d walk through alpine valleys, pink cheeked, our feet crunching on frost covered lanes, only to return, peel off our winter garments, and delight in the ooey-gooey running cheese that melted in golden puddles off the raclette machine. An obvious theme emerged as I circumnavigated the path along the bluff. For me the notion of comfort food meant walks, weather cold enough that it required a jacket, followed by nourishing food. The mild climate in Southern California has made me wistful for those crisp mornings where a trace of your breath lingers in the air. I realized that I missed frosty days and pulling on warm sweaters, curling up by a fire to read a book, thawing out after running errands outdoors with a glass of spiced, mulled wine or warm apple cider. I mentioned my winter musings to a friend in London. “Are you completely bloody mad?” she said. “You really want to be constantly damp, bone chillingly cold, surrounded by a sniffling populous?” Well, when you look at it that way, perhaps not. All of which leads me back to the notion that comfort food is more about the people you shared that dish with, and the environment that enveloped you. The comfort we find in these familiar dishes is like watching a sepia colored home movie. We may laugh out loud, reliving the antics on the flickering screen, whilst a bystander would be bemused. Comfort food is personal, so personal it can be a little like marmite (a yeast spread from Britain). If you grew up with it, marmite on toast is pretty fantastic. If you didn’t, it can be repellent. Each of us has our own comfort foods that are uniquely satisfying. While I may not rush at a plate piled high with kidneys on toast, I know those who would. The common denominator is the visceral satisfaction and pleasure we all derive from our particular comfort food, and the ability to share it. My lovely mum made fresh soup almost every day when I was a little girl. We delighted in those big batches of puréed vegetable soups and moped up the last remnants in our bowls with big chunks of bread. I have been a big fan of soups ever since. One of my favorites was, and is to this day, carrot soup. This version has leeks in it which add a silky texture and deepen the sweetness of the carrots. I like to make this if the weather is chilly or perhaps it’s been gray outside for weeks. 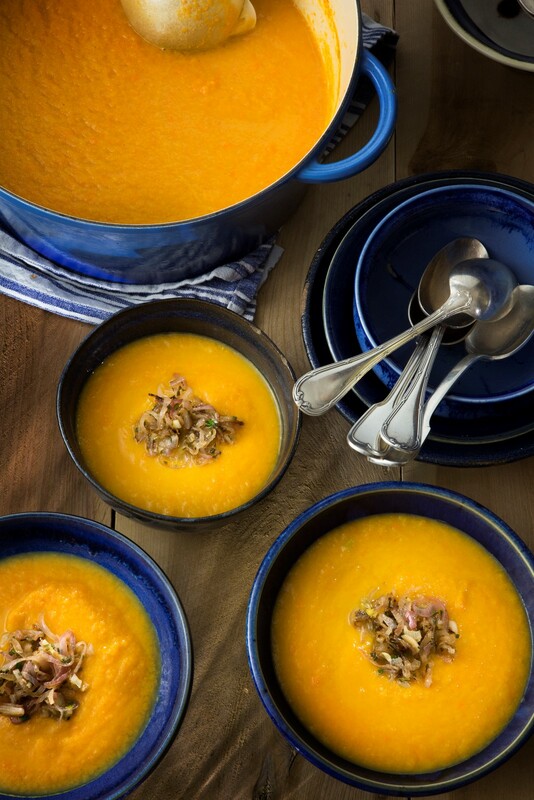 This soup brings a ray of sunshine and warmth into the kitchen, and warms your tummy. Heat olive oil in a large saucepan over medium heat. Add the leeks, onion and thyme and cook, stirring frequently, until the vegetables are soft and lightly browned. 8-10 minutes. Add the carrots, salt and pepper and cook for 5 minutes. Stir occasionally to ensure that the vegetables do not stick. Add the vegetable stock, reduce heat and simmer for 20 minutes or until the carrots are soft. Remove from the heat and purée the soup in batches in a food processor or blender or with an immersion until smooth. Return the puréed soup to the saucepan and keep warm until ready to serve. Just before serving, prepare the shallots. Warm a little olive oil in a small saucepan or skillet over medium heat. Add the shallots and sauté until golden brown. Add the chives, lemon zest and juice, and cook for 30 seconds more. Top each bowl of soup with a spoonful of the shallot mixture. There are few dishes that evoke comfort food like roast chicken and mashed potatoes. Is it something about the golden roast, the succulent aroma that permeates the kitchen as it sizzles in the oven? Or the cloud like, buttery, soft mounds of creamy spuds? My grandmother made mashed potatoes with obscene amounts of butter and crème fraiche. It was like diving into a decadent, edible, cozy blanket, the taste so good it enveloped you. I rarely make mashed potatoes now, when I do, and make this combination, it always puts a smile on my face and makes me think of her. Pour 3 tablespoons olive oil into a small bowl. Add the thyme, chives, parsley, oregano and lemon zest. Combine well to form a thick herb mixture. Using a small spoon which you slip under the skin of the chicken from the neck end, carefully spoon a little of the herb mixture under all of the skin (between and skin and the breast meat) Do this carefully so as not to break the skin. Pour a little olive oil into a large roasting pan and scatter the sliced onions in the pan. Place the chickens on top of the onions and rub the outside of the chickens with a little olive oil. Salt the inside and outside of the chicken. Place 4 lemon quarters in each chicken cavity. Add 7-8 grinds of fresh black pepper over the birds. Roast in the middle of the oven for 15 minutes and then lower the temperature to 375 degrees and roast for a further 1hr 15 minutes, turning the chickens once or twice so that all sides are evenly browned. When the chickens are cooked, remove them from the roasting pan and set aside to rest before carving, loosely covered with foil. Cut the chickens and serve on hot plates with the onions from the roasting pan, the root vegetables and mashed potatoes. Place the potatoes in a large saucepan of salted, cold water. Bring to a boil, then reduce to a strong simmer. Cook the potatoes until they are fork tender. Drain the potatoes, return them to the saucepan and let them release their steam for 1-2 minutes. Transfer them to a large bowl. Pass the potatoes through a ricer and return them to the saucepan. Add the butter, milk and crème fraiche and stir until fully incorporated and the potatoes are fluffy and creamy. Season to taste. Serve immediately. Winter is root vegetable season. I like to think of it as the time when the earth digs deep, searching for nourishment and as a result of all that hard work produces delicious vegetables, rich in minerals and with a wonderful array of flavors. My current favorite, parsnips, are delicious when roasted as they tend to caramelize on the outside but remain tender on the inside. They are also versatile. They add an extra dimension pureed with potatoes, added in soups they bring an extra earthiness in flavor and texture to the mixture and in a ragout of vegetables they will enhance the complexity of the dish. Serve this alongside the roasted chicken and it is a scrumptious way to showcase one of the season’s most delicious – if somewhat overlooked – vegetables. Place all the prepared vegetables on a baking sheet. Pour the olive oil over the vegetables and sprinkle them with the herbes de Provence, fresh thyme, the sea salt and some black pepper. Toss all the vegetables so that they are well coated. Roast the vegetables for one hour turning the vegetables once or twice so that they do not stick to the pan. I cannot think about winter without thinking about apple crumble. More particularly the apple crumbles my mother taught me to make as a child in London. The recipe was handed down to her by my father’s mother, Ilse. If ever there was a dish to warm you up on a winter’s day this is it. In those days we would go for great long walks across London’s parks, returning home with chilled fingers and toes and everything else in between. A hot cup of tea and apple crumble would instantly thaw us out and we would delight in the crumbles’ spices and buttery crust. Coastal California may not be as cold or damp, but the pleasure we derive from this dessert is undiminished. Place all the apple ingredients in a deep baking dish (at least 1 ½ inches deep and 9-10 inches in diameter) and toss to combine them well. To make the crumble, place the flour in a large bowl. Add 8oz of the butter and mix it with the flour, using the tips of your fingers, until it resembles coarse breadcrumbs. Don’t worry if you have little lumps of butter left – it should look like that! Add the sugar and mix to combine. Cover the apples with the crumble mixture. Sprinkle a little extra cinnamon and sugar over the crumble. Dot the surface with the remaining butter. Bake in the center of the oven for 40 minutes or until golden brown. Serve with vanilla ice cream or a dollop of crème fraiche, or both!